I've finished the main panel of the stole, just the edging to sort and then I can block:-) I'm a little disappointed that I didn't finishe this completely yesterday to coincide with the last day of the Tour De France, but I should only be a couple of days behind. I didn't plan to finish this within the 3 weeks, but as I got so close, I wish I had iyswim..... Anyhow, it looks the same as in the last post but longer. I'm planning on using an alternative knitted on edging so that I can finish within the yarn that I have, if it looks rubbish I can always frog and give in and buy additional yarn, but I think a differant edging will look ok???? I'm on annual leave this week, I had been hoping that the sun would shine, and although its really hot, the sun is reluctant to make an appearance:-( Lot's of knitting time though, which is always a bonus!!!! 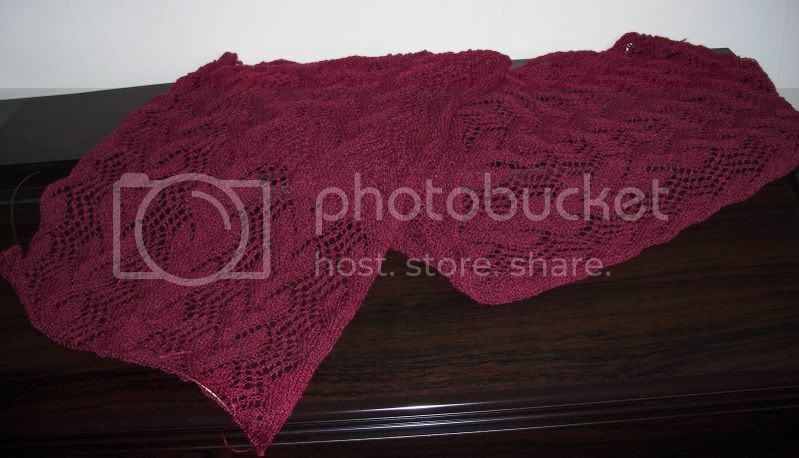 The shawl looks great. I am sure your edging will be fine. Hope you have a good weeks hols. Come on Sun!!! Shine for Terri!!!! The shawl is great and the edging you are gong to do will be good. Its been really hot here so I hope you have had weather like that too.